Radio Waves, a nationwide Motorola authorized two-way radio reseller, is reaching out to nurseries and garden centers -- including those who sell trees, shrubs, plants, seeds, bulbs, sod and other nursery and garden products to households, businesses and the farming community -- on the customer service and business performance benefits of the new Motorola DLR Digital two-way radios. The new Motorola DLR radio is the perfect digital radio for nurseries and garden centers. Nurseries and garden centers are sophisticated operations and need the same advanced technology tools as businesses in other sectors. Extreme range: the radios deliver clear communications indoors or outdoors, covering up to 300,000 square feet/20 floors, or up to 600,000 square feet with the optional extender. Immediate response: the radios allow staff to respond immediately to customer inquiries or provide real-time information on stock/inventory levels, etc. Enhanced audio clarity: the radios operate in the 900 MHz ISM, which allow staff to enjoy clear, static-free communication across an extended range. License-free operation: nursery and garden product businesses will not need to cover regulatory licenses and administrative fees. Durable, rugged design: the radios are designed to withstand rigorous outdoor use, unlike smartphones that can be vulnerable to scratching and breakage. Private communications: the radios use hopping technology to continually change frequencies, which makes it virtually impossible for unauthorized parties to listen in. Lightweight design: the radios feature sleek and lightweight design that allows staff to wear it conveniently on their belt or carry in their pocket, and come with comfortable, non-invasive ear pieces. Ease of use: the radios are designed for easy operation, and use voice prompts that allow staff to simply pick up a radio and start communicating immediately. Long battery life: the radios feature 14-hour battery life and easy recharging in their individual charging units. Multi-unit chargers that charge up to 12 radios at a time are also available. Other special features of the new DLR Digital two-way radios include: private reply, direct call, call all available, instant mute, talk permit tones, home channel, and advanced configuration menus. They also feature antimicrobial protection that inhibit the growth of bacteria and mold on radio surfaces. More information on the groundbreaking new DLR Digital two-way radios can be found on the Radio Waves website: http://www.twowayradiowaves.com. Headquartered in Parker, Texas, Radio Waves serves customers throughout the U.S. We focus on stellar customer service to best fit a customer's communications needs and are able to provide ongoing superior technical support. 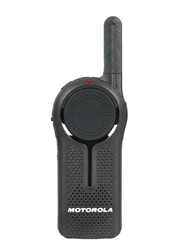 As an authorized Motorola business two-way radio reseller, we are able to provide Motorola's industry-defining products.